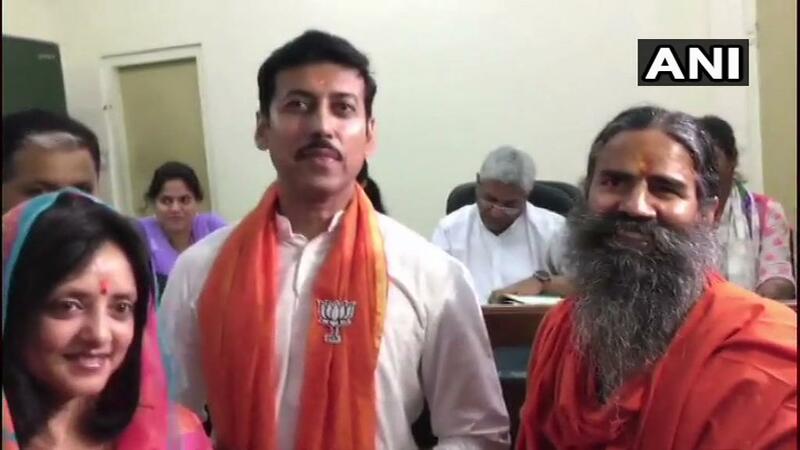 Jaipur (Rajasthan) [India], Apr 16 (ANI): Union Minister and BJP leader Rajyavardhan Singh Rathore on Tuesday filed nomination papers from Jaipur parliamentary constituency in the presence of Yog guru Baba Ramdev. Haridwar (Uttarakhand) [India], April 11 (ANI): Yog Guru Baba Ramdev cast his vote on Thursday in Haridwar. New Delhi [India], Apr 02 (ANI): Yoga Guru Baba Ramdev has said that mood of people of the nation is tilted towards giving Narendra Modi a second term as the Prime Minister's leadership abilities dwarfed those of other Opposition leaders. New Delhi (India) Feb 25 (ANI): Yoga Guru Baba Ramdev on Monday batted for the removal of Article 370 and Article 35A from the Constitution, which give special status to the state of Jammu and Kashmir, saying that there should be "one rule for one nation." Haridwar (Uttarakhand) [India], Feb 24 (ANI): Pakistan does not understand any other language other than that of war, said Yoga Guru Ramdev on Sunday. Raipur (Chhattisgarh) [India], Feb 19 (ANI): There is a need to divide Pakistan into three parts and merge Pakistan occupied Kashmir (PoK) with India, said Yoga Guru Baba Ramdev here on Tuesday. Nadiad (Gujarat) [India], Feb 9 (ANI): Yoga guru Ramdev appears to have stirred a possible controversy by claiming that Lord Ram was an ancestor of not only Hindus but also Muslims. Prayagraj (Uttar Pradesh) [India], Jan 27 (ANI): Yoga Guru Ramdev on Sunday vented anger over the Centre for not conferring Bharat Ratna to ascetics in the country. Amravati (Andhra Pradesh), [India], Jan 25 (ANI): It is horrible to see the youths of the country opposing the concept of marriage and even if they are married, they are not interested in conceiving a child, said Andhra Pradesh Chief Minister N Chandrababu Naidu on Friday. New Delhi, [India], Dec 15 (ANI): A memorandum of understanding (MoU) has been signed between Administrative Committee of Nabdagang Industrial Park (ACNIP) and Patanjali Ayurvedic Limited to promote Ayurveda research and science. The MoU was signed at Nabdagang in Hebei Province of China. Haridwar (Uttarakhand) [India], Nov 28 (ANI): Yoga guru Ramdev on Tuesday said that people will lose trust in the Bharatiya Janata Party (BJP) if Ram temple is not constructed in Ayodhya.